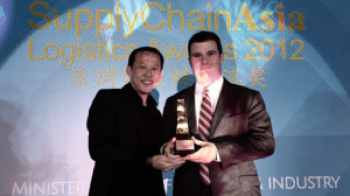 Maersk Line wins 'Shipping Line of the Year' title at Supply Chain Asia (SCA) Logistics Awards 2012 in Singapore. The company was judged best in class among operators in the region – beating other finalists that included APL, Cosco, Hanjin, and Yang Ming. John Corris, Head of Regional Key Client Management, accepted the trophy from SCA on behalf of Maersk Line Asia Pacific Chief Executive Thomas Knudsen. “It is an honour for Maersk Line to win such an award. It validates our commitment to our clients to be a trusted and responsible partner now and always,” Corris said. SCA is a Singapore-registered non-profit supporting the growth and development of the supply chain and logistics industry. It works with various sectors such as carriers and liners, infrastructure, retailers, government, and others. In the picture: Maersk Line’s John Corris, Head of Regional Key Client Management, receives the award from Supply Chain Asia.